Two people have been killed and more than 670 injured after protesters clashed yesterday with security forces in Cairo and Alexandria. The latest clashes came as police moved to prevent a long-term sit-in following a huge demonstration in Cairo against the military leadership on Friday. It was reported that some protesters lobbed rocks and a police vehicle was set on fire. The new violences come just over a week before parliamentary elections are scheduled to begin. Protesters – mostly Islamists and young activists – have been holding demonstrations against a draft constitution that they say would allow the military to retain too much power after a new civilian government is elected. Many Egyptians are frustrated at what they see as a reluctance by the ruling military council – who took power after the fall of former President Hosni Mubarak in February – to carry out meaningful reforms. Saturday’s violence in Cairo began when police moved to dismantle tents erected by demonstrators in Cairo’s Tahrir Square who had camped out for the night. The move to clear the square prompted thousands of protesters to return, and clashes erupted. Police fired rubber bullets as cars were set on fire, witnesses said. The numbers of protesters swelled, reportedly after a call went out on social media for people to join the demonstration following the police assault. Prime Minister Essam Sharaf called on the protesters to clear the square. 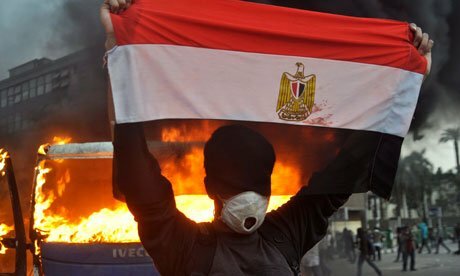 “What is happening in Tahrir is very dangerous and threatens the course of the nation and the revolution,” a statement from PM cabinet said. There were also demonstrations in Alexandria and Suez. The state-run Mena news agency says more than 670 people were injured. One of those wounded in Cairo later died in hospital, while a protester was killed in Alexandria during violent confrontations outside the offices of the interior ministry. AFP quoted a security official as saying a number of arrests were made. The interior ministry says a number of policemen were among the wounded. Friday’s demonstration, which saw tens of thousands fill Tahrir Square, was one of the largest for months. Parliamentary elections are due to begin on 28 November and take three months. Earlier this month, Egypt’s military rulers produced a draft document setting out principles for a new constitution. Under those guidelines, the military would be exempted from civilian overnight, as would its budget.